What do you need for a great girls’ getaway? First you need at least two good friends who like traveling together and have the same love of good times. What else would make the trip ideal? How about comfy accommodations, boutique shopping, relaxing salon treatments, outstanding wine, and exceptional cuisine, including decadent chocolate? The charming Scandinavian town of Solvang, California, has it all. I love traveling with my special friend, Linda Milks, who is relaxed, flexible, and likes exploring new places like I do. An extra bonus of traveling with Linda on our recent trip to Solvang was that she did all the driving and helped me lift my way-too-heavy suitcase out of her car. We also enjoy comparing notes on a variety of dishes and wines. And then we laugh a lot. Who could ask for a better traveling companion? After spending a few wonderful days in Pismo Beach and Carmel-by-the-Sea, Solvang, located in the Santa Ynez Wine Country about 30 minutes from Santa Barbara, was the final stop of our getaway venture. We stayed at the pleasant Hadsten House, where our rooms were cozy and artistically decorated in a classic European style, accented by French antiques. Hadsten House also has Solvang’s only heated indoor pool (very tempting), a day spa, and a wonderful farm-to-table restaurant where we enjoyed a delicious breakfast buffet. We would definitely come back to the Hadsten House again. We had dinner at the Landsby Hotel, a “Scandinavian modern” boutique hotel that opened about a year ago and looked like another wonderful place to stay on a future visit. Our dinner at the Landsby’s restaurant, Mad & Vin (meaning “food and wine” in Danish), was very special. We started with some refreshing creative cocktails, a ceviche appetizer, and tasty Castelvetrano olives served with spiced nuts. I enjoyed a flavorful Seafood Hot Pot with shrimp, clams, scallops and Linguica sausage in a savory saffron broth. Linda raved about her pan-seared lamb porterhouse with smashed fingerling potatoes, roasted Brussels sprouts, and mint chimichurri. 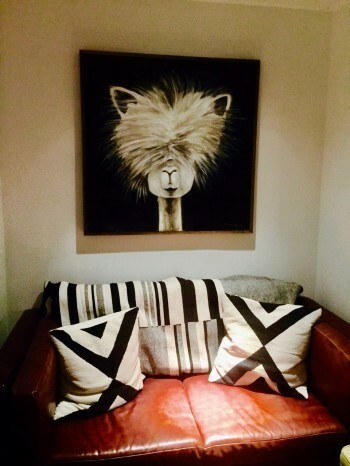 We were also enthralled by the restaurant’s stylish setting accented by striking artwork and decor. We almost felt as if we were dining in an art gallery. This is a must-stop dining destination in Solvang. Located in the Santa Ynez wine region, Solvang has more than 20 wine tasting rooms in the easily walkable downtown area—just one more reason that Solvang is a perfect girls’ getaway. You can walk from tasting room to tasting room savoring a variety of wonderful wines. 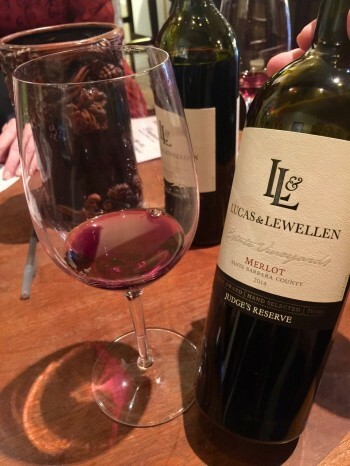 This trip we focused on the Lucas & Lewellen tasting room. This wonderful winery was founded and is owned by Louis (Louie) Lucas and Royce Lewellen. It’s interesting that Louis’ family is from Croatia where his father grew table grapes so his love of winemaking was ignited at an early age. We were fortunate that Louie, who is also the winery’s viticulturist, sat down with us to discuss his wines as we tasted them. We learned that the winery’s first grapes were planted in 1970 and, in addition to producing all the grapes for their own wines, the winery also ships grapes all over California and to many other states, including Texas, the Carolinas, and Virginia. Louie and his winemaker, Megan McGrath, talked about all the steps that go into harvesting grapes at the perfect time, such as measuring the sugar, acid, and Ph levels, and assessing skin color. We enjoyed tasting some really exquisite wines. I particularly loved the Pinot Noir, which was pleasantly floral with nice hints of dark cherries and chocolate; the earthy and spicy Merlot; and the Chardonnay, which was full of enticing apple and citrus flavors. But there were so many more great wines to taste here. 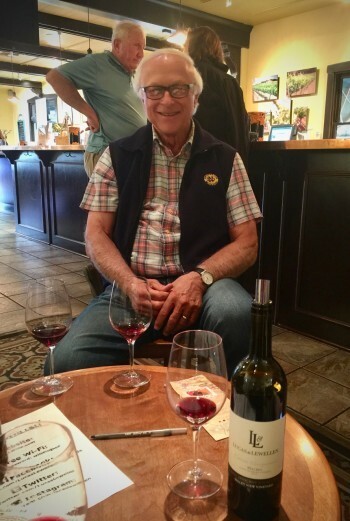 Louie’s love of winegrowing and production was contagious and we agreed wholeheartedly when he said, “Wine is culture Wine is history.” So of course we took some culture and history home with us. Is it a myth that girls love sweets or is it true? 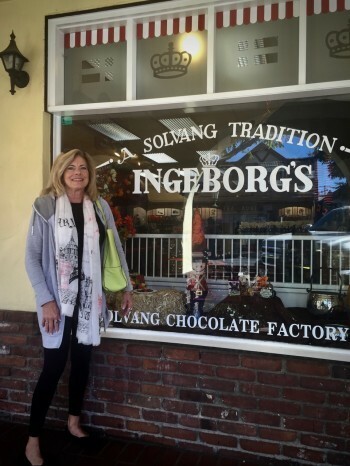 We think it’s true—so we loved the many tempting Danish bakeries in Solvang, such as Danish Mill Bakery, Olsen’s Danish Village Bakery, Mortensen’s Danish Bakery and the Solvang Bakery. These are all authentic Danish bakeries where we savored a variety of treats. We also felt "obligated" to stop at Ingeborg’s Danish Chocolates where all their candy is produced right in the back of the shop. The aromas were intoxicating and the tastes scrumptious. We found gifts here to take home to our chocolate-loving friends. 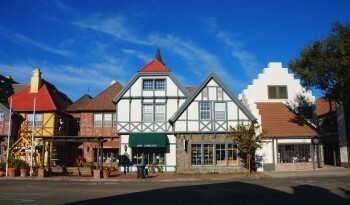 Solvang is full of appealing, unique shops with clothes, gifts, jewelry, and food items, many with a Scandinavian flair. It is so refreshing that no chain stores are allowed in Solvang. On this trip, we wandered in and out of shops, admiring their décor and distinctive items that we would never find anywhere else. In particular, we were tempted by the contemporary Danish offerings in the Copenhagen House, where we found the perfect stylish salad bowl for a friend’s birthday. All that shopping and tasting called for a bit of relaxation and special treatments. The beautifully landscaped setting of Enchanté Cottage Spa was a retreat enough in itself. Situated in a charming country cottage surrounded by lush rose gardens, the spa offers extensive nail services, massages, waxing and facials. An added bonus are the delicious cookies homemade by the owner, Deborah Paxton, who is personable and so happy to make her guests happy. And we were happy! Solvang also offers a variety of educational and entertaining stops that are ideal for brief breaks from shopping, snacking and sipping wine. I recommend Elverhoj Museum of History & Art as a first stop in Solvang if you have never been there before. The Hans Christian Andersen Museum and the Wildling Museum of Art & Nature are also fascinating stops. We had an all-too-brief but wonderful girls' getaway in Solvang but left feeling refreshed and energized. 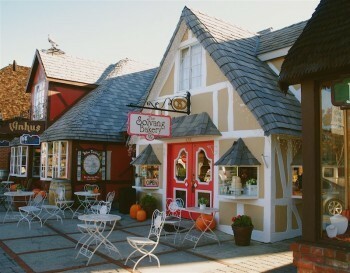 We'll be back to Solvang, one of our favorite California destinations.